It is now March and another month has come and gone in our preparedness efforts. Does everyone have their salt and spices supply? If so, I would LOVE to hear your success stories!?! I know I had fun this week going to Costco and picking up 1,400 lbs. of salt–ah! I didn’t have my phone or camera to take a picture, but it was really quite a scene, people thought I was nuts (which I thoroughly enjoy!) My Dad and I went to pick it up and could barely even push the flat bed cart down the aisles. Don’t worry..all of that salt wasn’t for me (surprise!). I picked up salt for 30 families in my neighborhood. We are all thrilled to officially have our year supply of salt. If you have not picked up your salt supply yet, head over to Costco or Sam’s Club and for under $3.50 you can pick up 25 lbs. of salt. Fabulous!! Now, onto another goal and food storage focus this month: BEANS (I can hear the applause already!) I am actually really excited about this new food storage item for March. I hope that by the time this month is over you will be shocked at the many ways you can use beans/legumes in your everyday cooking and baking needs. Most people think of beans as only good in chili’s. Oh contraire..beans are good in many other menu items; soups, stews, dips, appetizers, wraps, on salads, and even used in baked goods like cookies, cakes, brownies and breakfast foods. I know many of you won’t believe me now, but just wait until our month of bean-o-fun is over and then you will thank me for introducing you to such a versatile item. WHY STORE BEANS: Beans are an important part of your 3 month supply and your 12 month food storage supply. Canned beans and dried beans can be easily incorporated into your family’s diet. With canned beans you can make chilis, soups, stews, dips, enchiladas, etc. Besides canned beans, it is important to have an adequate supply of dried beans. Dried beans will last up to 30 years and will provide an important source of protein to your family’s diet. Dried beans can be ground into flour, cooked and pureed, and used in the place of oil in baked recipes, or boiled and used in some of your family’s favorite meals/soups. The uses of beans are endless! HEALTH BENEFITS OF BEANS: Beans are an outstanding source of protein—the highest in the seed family (even more so than wheat). Wheat averages a protein level of 8-16% whereas beans have a an average protein level of 22%. They contain all essential amino acids, except methionine. Methionine can be obtained from corn, rice, or meat. When you pair beans with one of these items (such as rice) you then have a complete protein, which will sustain life. 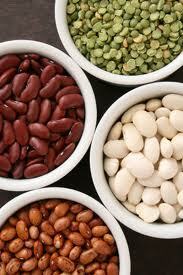 Beans are also an excellent source of fiber, starch, minerals and some vitamins. HOW TO STORE BEANS: Canned beans can be kept on a shelf for 2-3 years. Dried beans can be stored in #10 cans (from the LDS Dry Pack Cannery), in Mylar bags or for less expensive storage they can be stored in food grade plastic containers. You can empty the dried beans into a plastic bucket or you can keep them in their original packaging within the bucket—either way will work just fine. You may also want to place an oxygen packet inside the bucket for optimal storage. Now that we know the importance of storing beans and some of the amazing health benefits, let me introduce you to a new recipe I have found for Ultra-Healthy-Whole-Grain Pancakes. If you are a fan of those light, airy, white, no-nutrition filled Krusteaz pancakes, then you may not be a fan of this recipe. If you however, are looking for a quick breakfast idea that is chuck-full of nutrients and whole grains, this recipe is for you. These pancakes are dense, filling and SO good for you! One of the benefits of eating whole grains is that you become full more quickly than if you were to eat white flour products. My son, who normally can eat 7-8 buttermilk (white flour) pancakes, could only eat two of these pancakes. He was stuffed after only a couple. In fact, all of my kids were so full after breakfast we didn’t even eat lunch until nearly 1:00. So..give these pancakes/waffles a try for a heart healthy, homemade breakfast (that surprisingly uses dried beans from your storage). Combine the wheat kernels, oats, brown rice and white beans together in a bowl. Then, pour this mixture a little at a time into your wheat grinder until ground into flour. Pour this flour mixture into a large mixing bowl or Tupperware. Add the remaining pancake ingredients to the flour/grain mixture and whisk until combined. Once pancake mixture is combined, place in a Ziploc bag or large tupperware and store for several months. When ready to make pancakes, add the following items to the pancake mix and whisk until smooth. Each batch of one cup of pancake mix, makes four thick pancakes or waffles. This recipe makes 12 cups of pancake mix. I am so excited for this months goal! 🙂 I love beans and look forward to new ways of using them in cooking. Thanks so much for what you're doing with these monthly goals. For the first time in my food storage I don't feel overwhelmed!!! And I'm becoming more and more confident and I have peace of mind that it's getting accomplished. In the past I felt like a deer in the headlights. Thank you, Thank you, Thank you!!!! 🙂 Your truly a blessing to me. Our family isn't big on beans, but then my sister passed along this recipe for pizza dough, which I tried and our family loved. Nobody even realizes that they are eating beans, and like the article says, adding beans to pizza dough dramatically increases the fibre and creates a complete protein when combined with the flour. When I make this recipe, I double it to make use of the entire can of beans and just put half of the dough in the freezer for another meal. I have used it for both pizza and focaccia with great results. Thank you so much for all the information you share. I love reading everything you share. My children LOVE pancakes. I am thrilled about this new recipe. I have one question. After placing the mix in a baggie can you leave it out on the shelf or is it better to put it into the refridgerator? An easy and healthy way to cook beans is in a crockpot! Many recipes online. I am so excited to learn more about beans. I have really been wanting to cook with them more. I was told that once you grind wheat that if not used within a short period of time, it will lose it's nutritional value. Was I misinformed. And would that be the same for the pancake mix? I would love to mix up a bunch and use as needed. I feel like I would use it more often. I was just concerned about losing the nutrients. Please let me know what you think. Thanks! Would it be possible to add powdered eggs to the mix, instead of adding the regular egg in with the wet ingredients? If so, how much powdered eggs would I need to add to the mixture of dry ingredients? I have a question about the white beans. I have always rinsed my beans before using them. I don't want to put wet beans in the grinder so if you grind them in the grinder how do you clean them first? I am sure you could use powdered eggs. The recipe says that it makes 12 cups of mix and for each 1 c. of mix you need one egg. I would assume you could add 12 T. of dry powdered egg mix and then add an extra 2 T. of water to the mix. Before you add all of that powdered eggs though I would try making one batch of the mix with one powdered egg equivalent and then start from there and make sure it works. Powdered eggs can sometimes make the product (pancakes, cookies, etc.) a little more flat than a regular egg. If the pancakes turn out too flat, then perhaps with this recipe you may want to stick with a real egg. These pancakes are not the most fluffy ones any way. Because they are made with all whole grains they are more of a dense pancake, so you may need a little lift that a real egg can bring. Thanks I love the addition of dried beans to a whole wheat pancake recipe! I can tell that this is going to become my standard pancake mix. Hmmmm…I can honestly say I have never washed my dried beans–oops! Do you really use 1 cup of baking powder? That seems like so much even in the mix? Thanks so much for all your ideas and recipes – I sure appreciate them! Thanks – I appreciate your response. I am going to work on this today so we can have them tomorrow! You are right we do use it a lot. Guess I need to add more to my food storage! MMMMmmmm MMMMMmmmm Very tasty recipe I really like this food. I will taste it then i will try to my home kitchen. very sweet and tasty food I like this food I say thanks for the nice idea and instruction I love more than. I loved this – we made our first pancakes today and they were wonderful and fluffy. It was also great because we have started Weight Watchers, and this is a VERY nice low point option that keeps you full for a looooonnng time. Thanks SO much. I am really excited to try this recipe but I'm nervous about the milk. I have messed up some recipes in the past by using instant dry milk. Is this recipe using instant or non-instant dry milk. Thanks! I've made these twice and I've had a hard time with them. They seem fluffy, but when I put them on the griddle they flatten out. They are so thin that it's hard to flip them. They turn into a disaster. I've tried adding a little more soda and a little AP Flour. Any suggestions?? I love the flavor! I did have one batch that had that same problem. I don't know if I measured wrong or what I did. Either way, adding more flour did the trick. Anytime you have a pancake, waffle, cookie or bread that is too heavy and flat, just add a little more flour and it should puff right up. This recipe has plenty of baking soda, so I think you are okay on that. In fact, the last time I made this mix I used a little less soda. I think too much soda also can have a flatteing effect. So..more flour, a little less soda and you should have the perfect, healthy pancake 🙂 Good luck! You will love them. You may want to try halving the recipe the first time you make them. It makes a lot! It is non-instant milk. The stuff you can get at the LDS Dry Pack Cannery or online. The dried beans I get from the LDS cannery don't seem to need to be washed. So..I don't (bad, I know 😉 If you feel you need to rinse your beans first, just do it days before grinding so they have time to totally dry before putting them in the grinder. If you have any moisture left on the beans, it will ruin your grinder.